While the media remains intoxicated and fixated on Apple’s iPhone and Samsung Galaxy S4, LG has been steadily growing its smartphone business and market share. LG doubled smartphone shipments in the second quarter of 2013 to maintain the number 3 spot, according to market researcher IDC’s latest survey. 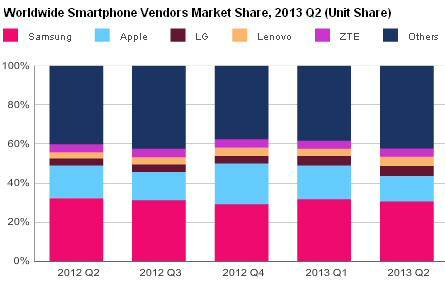 LG owned 5.1% of the smartphone market in the second quarter of 2013, up from 3.7% in the same period a year ago. IDC estimates LG more than doubled smartphone shipments to 12.1 million units in the second quarter of 2013 compared to 5.8 million units in the second quarter of 2013. Apparently, LG has managed to even eke out a profit from its Android smartphones. LG seems to have reinvigorated its smartphone portfolio with the Nexus 4 and the Optimus G Pro and is now eying the high end with its upcoming G2. The company also has the L-Series II and F-Series smartphones aimed at the mass-market. Samsung remained the king of smartphones although its market share dropped to 30.4% in the second quarter from 32.2% in the same quarter last year. The “others” category of smartphones has climbed to 42% suggesting these are cheap Chinese devices creating havoc in the market and sleepless nights for Apple and Samsung executives. The overall smartphone market registered a robust growth of 52.3% in the second quarter of this year to grow to to 237.9 million units. Things are looking tough for Apple squeezed as it is between the Samsung Galaxy S4 at the high end and the cheap Chinese smartphones at the low end. Although Apple increased unit shipments of its iPhones by 5.2 million units, its market share fell by 3.5% to 13.1%. Apple is a few months away from launching a cheaper, plastic version of its smartphone aimed at developing countries like India, Brazil and China. It remains to be seen if the cheap iPhone will give Apple a push in emerging markets. Overall, smartphone vendors shipped 237.9 million units in the second quarter of 2013 compared to 156.2 million units in the same quarter a year earlier. Smartphone shipments registered a 52.3% year-over-year-growth, the highest annual growth rate in five quarters. Second quarter shipments were up 10% when compared to the 216.3 million units shipped in the first quarter of 2013. I wonder how long it’ll take for all mobile phones to be smartphones. Nokia continues to bleed market share, dropping its share from 20.5% in the second quarter of 2012 to 14.1% in the same period this year. Whether Nokia’s low-end smartphone takes off in emerging markets like India remains the $64,000 question. The worldwide mobile phone market grew 6.0% year over year in the second quarter of 2013 to 432.1 million units. Freeloaders Can Smile Today Android Clobbers iPhone on Marketshare; So Why is Apple Still Smiling?